Conventional knitted socks! Such a simple and at the same time the required product, which can be linked independently. What to choose for this model? And what type of gum to choose for knitting socks, that looked nice and served a long time? Elastic band elastic band strife, but want to be her aesthetic appearance is preserved, without losing the original shape. To select a pattern and start knitting elastic band on socks, you will need yarn of any color and various textures. Also need a set of spokes in the amount of 5 pieces. Knitting a sock that begins with gum, and therefore have the opportunity to experiment with chosen pattern and in case of failure, to wrap it up. You can knit the elastic band on socks in different ways. Gum 1x1. Dial 56 loops, start to knit, evenly distributing the total number of loops. Thus, will turn on each spoke for 14 loops. Knit according to the scheme: *1 front loop, 1 loop purl*. Follow this scheme throughout the process of knitting elastic. If at first it would be not really perfect binding – don't worry, because after washing the ranks will be smooth. The consumer appeal of this type of gum is the most convenient because it tightly hugs the ankle and less stretched. Elastic 2x2. Also, dial 56 loops (depending on size of socks) and in the process of knitting the first row evenly distribute them on 4 spokes, it has 14 loops. Knit according to the scheme: *2 stitches front, 2 stitches of purl*. Continue to knit in pattern, i.e. knit facial loops, purl – purl. This elastic tends to stretch out faster, although for some time the leg fits well. Gum 1x1 (modified). Also, dial 56 loops and distribute them on 4 spokes. Then knit according to the scheme: *1 front loop, 1 loop purl*. The only difference from the usual method of knitting that the front loop promazyvaetsya not into the loop of the previous row and under it. In this case, an odd number is to have the scheme: *1 facial (under loop), purl 1 (normal)*. An even number of knit according to the scheme: *1 front loop (plain), 1 purl loop (looping it)*. This type of gum is more suitable as a decorative ornament because it looks extremely smoothly, even with the "sloppy" knitting. In addition, it does not possess a sufficient degree of density, but perfect for knitting socks and bootees for young children. Gum is one of the most important elements of many products, related spokes. The majority of models of clothes is not complete without this simple, yet functional pattern of knitted fabrics. It can serve as a tightening item to the product or to create a base web. Experienced craftswomen have their secrets that can make elastic gum is especially neat and convenient to use. - knitting needles No. 2.5 and 2. Work out in the crochet elastic headband in different ways, and evaluate the resulting sample. Work on straight needles, sequentially alternating front and back loops. You get the so-called elastic 1x1. Depending on the number participating in the eyelets, elastic fabric may be referred to as 2x2 (2 front – two inside-out); 3x1 (3 front and 1 reverse), etc. Some of the products at simple alternation of a certain amount of facial and purl loops look quite spectacular and without fussy patterns. For example, from gum 3x1 or 4x1, you can perform a skirt or turtleneck – things will be exciting, will be stretched in two directions and lie on a "slinky". Try to associate the gum with the help of auxiliary yarn to make a particularly smooth and elastic hem products. For this you need a basic white yarn and a thinner thread bright contrasting colors to catch the eye (e.g., red). Take a couple of straight spokes №2,5 and another pair No. 2. Type of red thread on the spokes number 2 twice smaller number of loops than necessary to create a cloth. For example, instead of 20 loops on the needles should be only a dozen. Get the first row of the elastic edges of knitting, typing in the work of white thread. First remove the edge loop, then do the reverse. Then followed: yo, purl the loop and again yo. Finish the number pattern. If the work involved an even number of loops, the final will be nakyd and edge loops, if odd – yo, reverse and edge. Complete the second row of knitting according to the pattern: the lower reverse loop promazyvaya the front, and nakedi remove nepovezane as if they were ordinary purl loops. The working thread should be placed just before the loop! Repeat knitting the third and fourth rows of the example first and second, until the band hollow double cloth. Now you need to type in the spokes № 2,5 and knit with the fifth of a series of elastic rubber 1x1. When knitted elastic fabric is finished, you can carefully pull out the auxiliary thread. Open stretched out loops on the edge of the work dismiss you perfectly smooth, good stretch, edge knitted elastic. Please note that when knitting elastic headband on straight needles is necessary in the front row to perform alternating front and back loops; purl rows should carefully assess the downstream loop and to work according to the pattern. 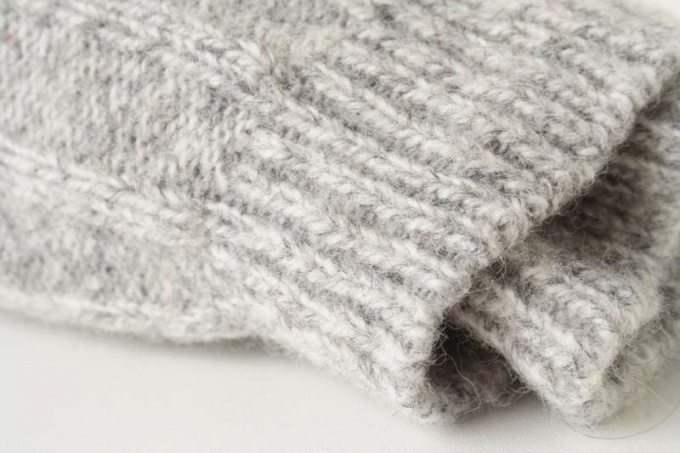 When working on circular needles purl rows will not be – just knit all one sample.